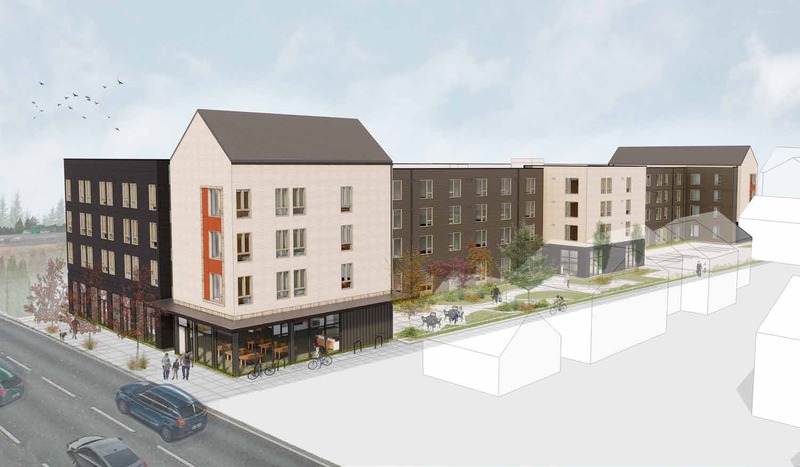 The Design Commission has approved an affordable housing development at 9747 NE Glisan St, designed by MWA Architects for Northwest Housing Alternatives. The Oregonian reported on the Design Commission’s approval of a 159-unit affordable housing project at 9747 NE Glisan St.
NBP Capital plans to buy and renovate the historic Multnomah County Central Courthouse, reports the Oregonian. The building is being sold for $28 million plus 2 years of free rent to the County. Hat Yai 2.0 will have vegetables, table service, and elbow room, reports Eater Portland. The Thai restaurant is set to open in the Modera Belmont by the end of November. The Portland Business Journal reports that Muji has opened a pop up shop to give Portlanders a sneak peek at what’s to come when it opens in the Meier and Frank Building. This entry was posted in 9747 NE Glisan, Block 216, Meier & Frank Building, Modera Belmont, Multnomah County Courthouse (1914), MWA Architects, NBP Capital, Northwest Housing Alternatives, Pepsi Blocks, weekly roundup. Bookmark the permalink. There is no reason for the Theological School on Gilsan to have housing repair that would effect anyone not attending the school. Multnomah University is an accredited University here in Portland, Oregon not a public housing complex of an apartment complex. Please, Please, Please check this address because it a University at 9747 NE Glisan. The address for the proposed housing is correct. Multnomah University is approximately 12 blocks to the west, at 8435 NE Glisan St.